Toycon 2011 bring forth cosplay, anime and toys. Among the many toys exhibited during the event what caught my attention was "CHALLENGE 21." It is a proudly Pinoy game. The said game promotes mental alertness, abstract thinking, observation skills, creative strategizing/thinking out of the box. The game implements principles of Tic-Tac-Toe, Scrabble, Bingo and Basketball. SCRABBLE PRINCIPLE. "To form" a combination of shapes or patterns with corresponding points including, at least, 2 papillon shapes. TIC-TAC-TOE PRINCIPLE. "To block/prevent" opponents from forming patterns. BASKETBALL PRINCIPLE. To win, the first to score a total of at least, 21 points after deducting the "PENALTY/IES", if any. BINGO PRINCIPLE. To win a player must declare "DEAL". The right to win of a player who first scored 21 points but failed to declare deal is forfeited in favor of whoever reaches 21 points who declares deal. The minimum points given in a game is 2 points. This can be earned by forming a "Papillon" or "Kite". The highest point possible is 21 points awarded by forming a "Kite Formation", "Cuadro Formation" or a "Cross". This game is indeed interesting and might be one of the best invention when it comes to simple games that any age or family member can play. 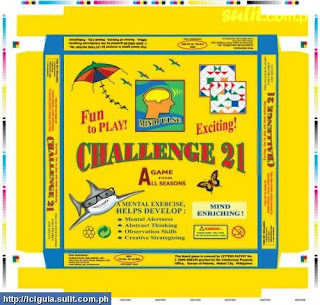 I am highly recommending CHALLENGE 21 to all. Thank you for sharing this good post.I like technology.